Polaroids and pool tiles, roses and rooftops, The Poise likes to keep people guessing. Ever since catching a glimpse of the band through their 3 song EP, people have been compelled to figure out who The Poise really are. A product of the DIY scene in Baltimore and well versed in the house show and bedroom recording culture, The Poise was born in May. 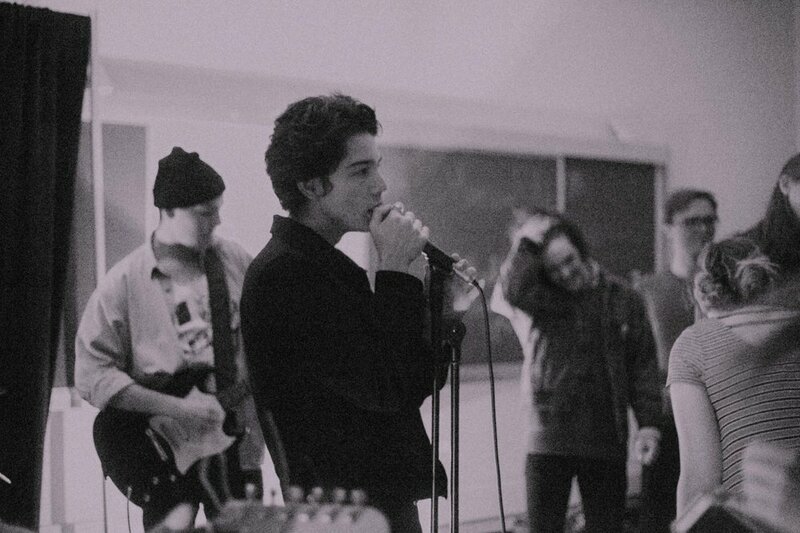 Pulling inspiration from the scene they were emerged in while simultaneously navigating their way into uncharted territory, they compiled a mix of classic indie rock infused with their own flair on their debut EP Visceral. Visceral, defined as relating to deep inward feelings rather than intellect is a theme that pops up all over the album. Not only do the lyrics carry on this motif, but the music itself evokes a strong emotional reaction. “When To Close Your Eyes” perfectly distills the essence of visceral as the protagonist urges the girl to learn when to end things and when enough is enough. She continuously places her emotions above her intellect even while she is being emotionally damaged by her seemingly reckless actions and false hope. The song is laden with an underlying static sound mingled in with a fuzz pop aura. “Covet,” is an absolute anthem taking the poignant ambivalence intermingled in the album and silencing it with the repetition of “am I right or am I right?” showing that there is no room for the protagonist to question his actions. Despite the mocking ignorance and stubborn nature the track plays it off with a subdued vibe and a chilled out sound which juxtaposes the strong message. Soft and static, it embodies The Poise so far. The whole EP laced with guitar heavy tracks and a static lo-fi demonstrates the band’s lyrical skills, seeming more like poetry as they call to mind incredibly in depth stories with poignant details. You can see the low-lit city streets, the people chain smoking outside, feel the ambivalence, the love, the passion, the confusion. Using these subdued sound they manage to navigate through the labyrinth of mixed emotions thrown at them.